Looking for a new hair color but yet unsure what color it should be? 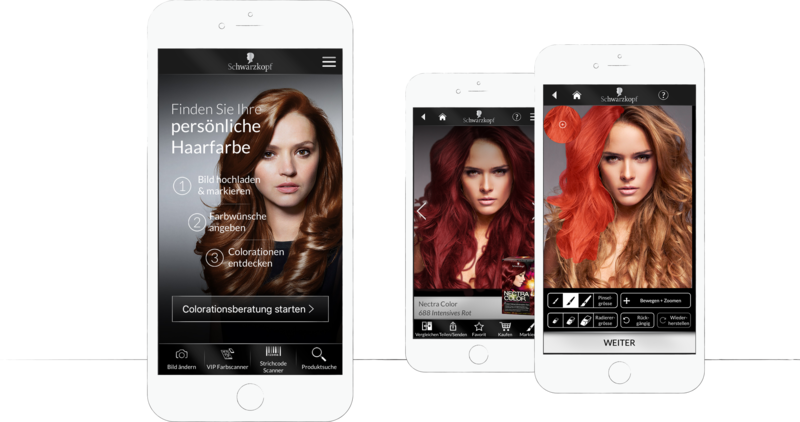 Released and enhanced from 2014 to 2016, the Color Advisor App from Schwarzkopf & Henkel Beauty Care gave it’s users a smart way to check if any hair color looks nice on them – just via uploading a picture of themselves and then coloring their own hair. The home screen showed up all features the app had included – with the main function highlighted as a big button. Next to the color advice function there had been a „VIP Scanner“, a „Barcode Scanner“ and, of course, a direct product search. Firstly, in order to color the own hair, users had to mask their hair on the uploaded picture via coloring it with the finger. 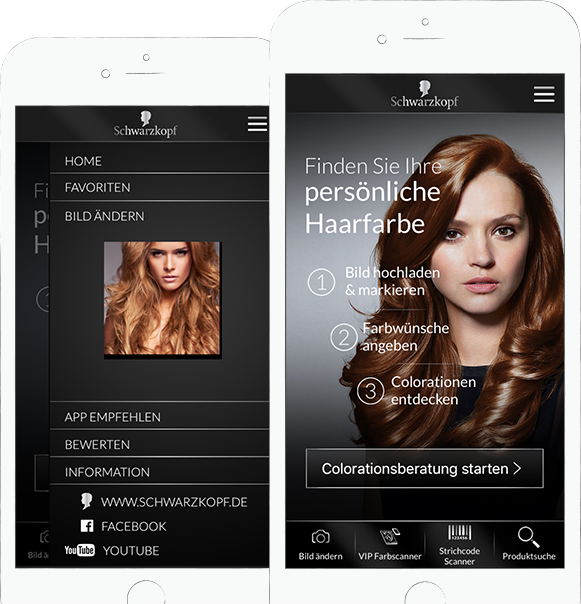 After that and after having named it’s natural hair color, a sophisticated algorithm colored the masked hair section in any Schwarzkopf coloration the users selected. Combined in one awesome app! 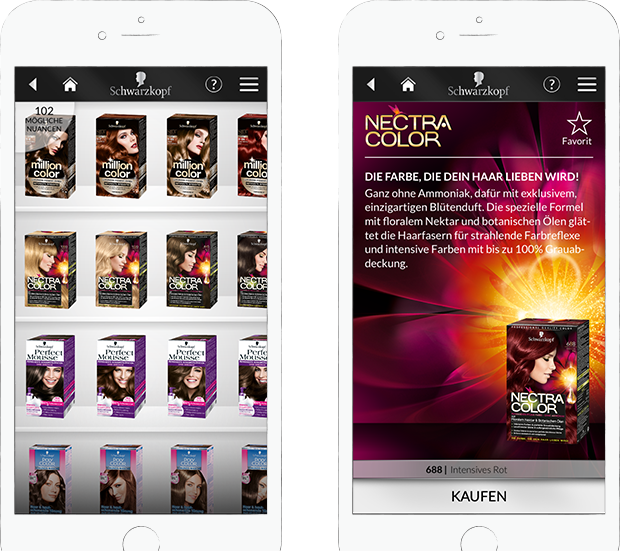 Users had the possibility to choose their new hair color from any existing coloration of Schwarzkopf and it’s brands – shown in a virtual shelf. Furthermore, all colorations came up with a beautiful brand visual, some brand information and, of course, a buying option. 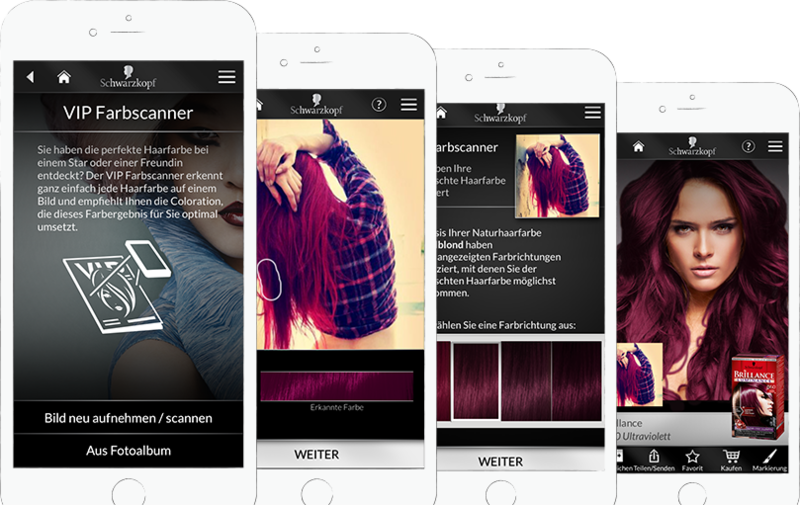 The VIP Scanner gave users the possibility to take or upload pictures of people wearing the perfect hair color to then find out what Schwarzkopf colorations match the wanted color best. The result was based on the color identified from the picture and the user’s natural hair color. The Color Advisor App was the first mobile app I ever worked on, so it was a complete new experience for me and definitely the starting of my love for mobile app design. Thus, I had already been designing websites and web apps for years, the complexity of designing an app for several different devices had been a truly welcomed diversion, as well as a huge challenge. I had to learn a lot about the different functionalities and specifications of iOS and Android and, of course, about the many differences between mobile web design and mobile app design – and I really loved it. It was great fun working with the team behind the app on both sides, the company and the customer and we’ve been very proud of the result of many months of hard work.